Google dropped the news last week that Nearby was about to get a whole lot more interesting. With the use of Bluetooth and a special blend of tricks collectively known as Location Services, Google will enable Android devices to learn about all manner of things in close proximity, whether they be Eddystone beacons, Chromecasts, or even Android Wear watches waiting to be set up. In the announcement, it was mentioned that an update to Google Play services would be rolling out shortly that adds support for all of these new features, and this is the one. While most of the features have already been disclosed, there's one in the teardown that wasn't mentioned. We're still looking for more changes, so let us know in the comments if you stumble onto anything else. A quick note for those looking to pick up the apk early. As of this post, the only variants available are for pre-Lollipop devices with either x86 architectures or very low density screens. If you don't have a device fitting the bill, you should definitely wait until a suitable variant is available. Most of the new features were discussed in our previous post about the new Nearby, so it seems pointless to be too repetitive about them. However, here are few screenshots showing a little bit of what to expect. 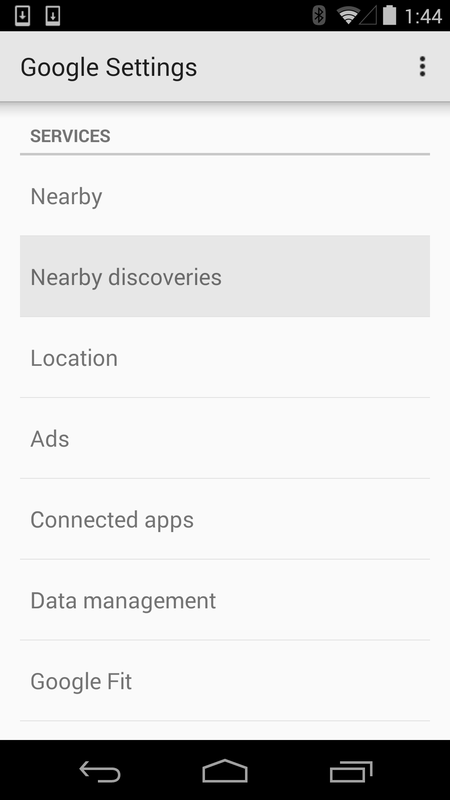 If you poke into Settings and go to the Google section (or open the Google Settings app in 4.4 and below), you'll find the new 'Nearby discoveries' section in the list of Services. It's pretty simple, including a welcome screen with an opt-in question and a button to open a second screen for notifications. 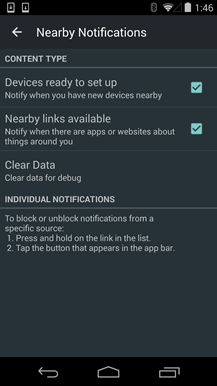 The first notification setting for devices that are ready to set up is enabled by default. The second setting is disabled to begin with, but it may be turned on by the opt-in question at the beginning. Below the welcome screen is also the place where current and blocked notifications will be listed, giving users an easy way to add or remove them from a blocked list. Based on a teardown–but currently untested–it looks like the Wear and Chromecast setup features are ready to go, but it's entirely possible that those will require firmware updates before they are themselves ready to work with the new Nearby. It's worth noting that the order of the Services list has been changed to push the Nearby and Nearby Discoveries sections to the top. This tends to happen anytime Google is featuring one of its services. 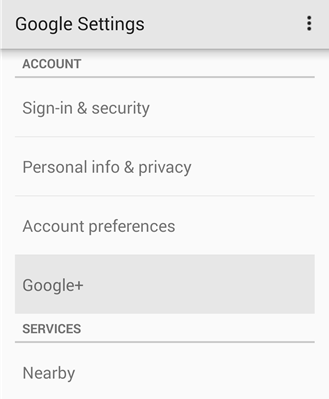 One more very quick note about the Google Settings screen: there is now an entry for Google+ under the Account section. 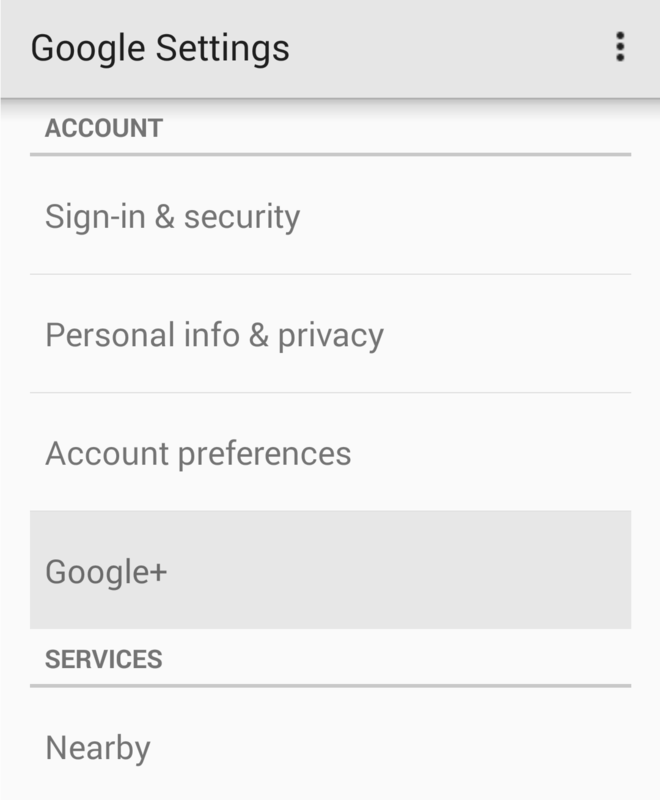 It's just a shortcut to the Google+ account settings, nothing more. For years, the simple act of getting a file from one phone to another has been an oddly difficult and inconvenient chore. It's not that it's impossible to do, but each of the common methods comes with some kind of inherent flaw. There are service like Dropbox, Drive, or even email, but they chew through cellular data. Bluetooth is an option, but it's slow, requires pairing, and it's wildly unreliable. Most other methods require additional hardware or specific brands or models of phones. Why shouldn't we just have a single, easy to use method for making a connection and throwing a file at somebody? Nearby to the rescue! Ever since Google introduced Nearby, users have been requesting a quick, efficient, built-in way to send files to those standing right next to them. It looks like that might finally happen. (Maybe...) New text in the apk shows that Google is adding the ability to broadcast a file and allow others within close range to download it. <string name="hint_for_receiver">"Tell the Receiver to go to Bluetooth Settings. The one potentially disappointing detail is that Bluetooth still appears to be at the center of the transfer. There are no references to either Wi-Fi or Wi-Fi Direct. 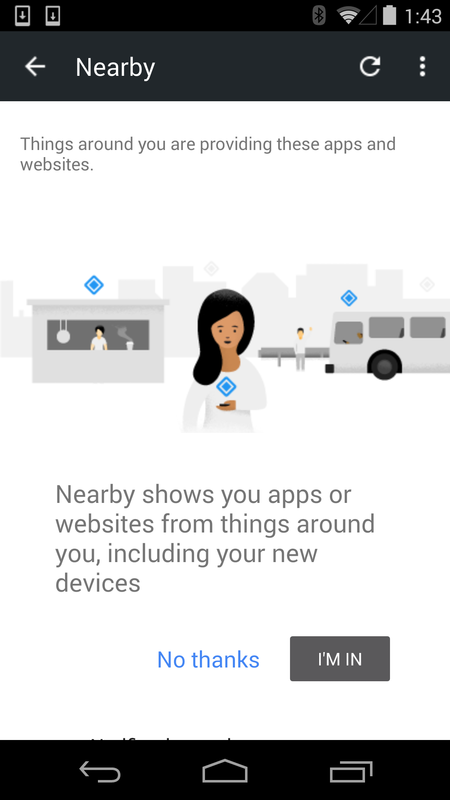 If it turns out that transfers are still going to happen via Bluetooth, the only real gain from using Nearby will be a streamlining of the initial connection steps–basically you won't have to search for or pair with another device from a crowd. 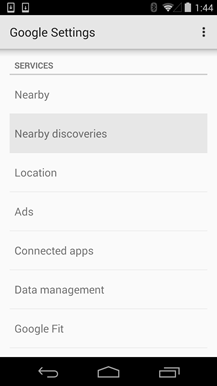 Ideally, Nearby should try to find the fastest method to get a file over to another device, then negotiate down to Bluetooth if there is no other alternative. But just because the text doesn't mention faster methods, it doesn't mean that they won't be used, or that they can't be added in the future. Also worth noting, this method involves sharing a file publicly and allowing other people to grab it at will. Unlike typical methods to send a file, this is a free-for-all approach. This is certainly better for sharing something with several people at once, perhaps a few pictures of a group of friends; but it's not a good idea for sharing things that should remain private. Files won't be the only thing that can be shared through this method, URLs can also be broadcast to people in the vicinity. This will probably come in handy for regular convention visitors and the like. Unfortunately, at the time of this writing, it's not clear if this feature is actually live. It seems likely that this broadcasting functionality may involve advertising a device as if it were a beacon. 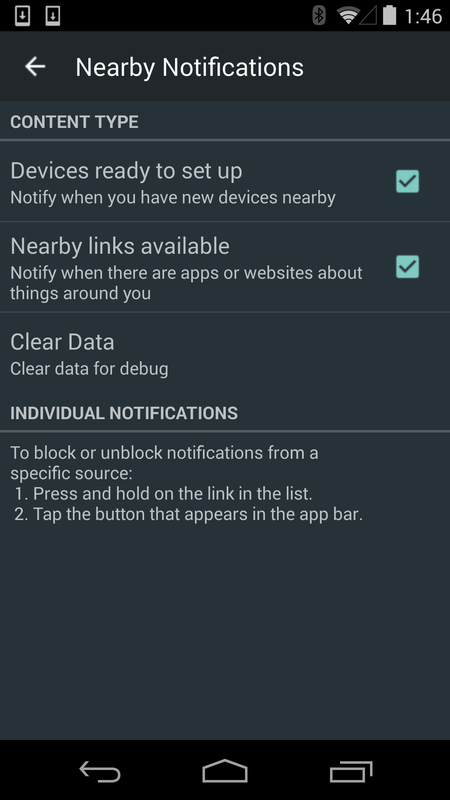 While Nearby technically works as far back as Gingerbread, some documentation on the developer pages hints that advertising as a beacon is only possible with devices running Lollipop and above. Here's the catch: the only variants currently available are for pre-Lollipop devices. We'll just have to wait for more variants to roll out to check if this is going to work. I won't dump all of the new text or resources here because they look like they were taken directly from the Wallet app, but I wanted to mention that there have been a ton of layouts and text added to the Play services apk. Just to be clear, I'm talking about Wallet, not Android Pay. There's a very real possibility that this has something to do with the Nearby expansion, which would make Wallet much more convenient to use with people without dealing with email addresses or phone numbers. It's not clear from the text if this is actually what's happening, so it could just be a coincidence, but I'd expect this to be the direction it's taking.